Students are expected to come prepared for their audition. Arrive early and with all necessary materials. (e.g. Sheet music, permission forms, appropriate dance attire). 1. Sing BOTH audition songs for their voice type. We have selected 2 contrasting songs which will allow students to demonstrate their vocal abilities as well as their ability to convey an intentional character while they sing. 2. Participate in a "cold read" of a scene. This portion of the audition may include other students to read with. This will allow students to demonstrate not only their ability to deliver lines in a convincing manner, but to interact with and respond to other characters in a scene. 3. Participate in a dance/movement audition. While not all roles will require intense dance capabilities, all students participating in the musical must be able to move with intention, respond well to staging directions, and learn basic choreography for one or more musical numbers. 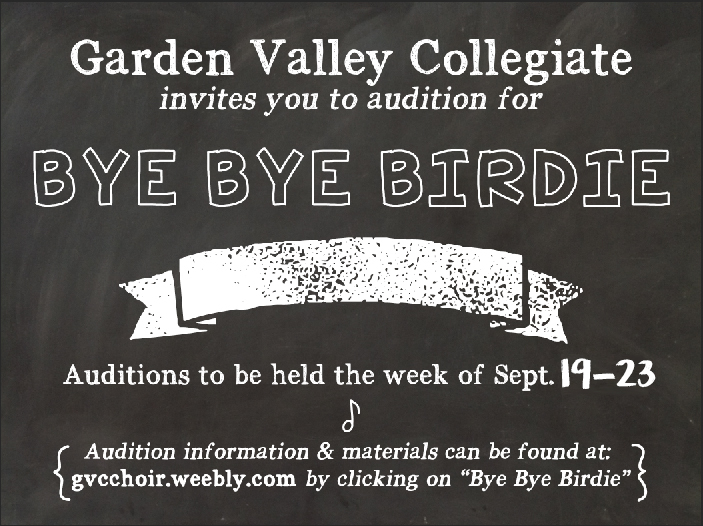 The week prior to auditions, there will be 2 opportunities for students to come learn the audition music. These are not mandatory sessions, however students who do not attend are expected to learn the music independently and/or arrange an alternative time to learn the songs with Mrs. Urichuk. It is the student's responsibility to arrange an alternative time if the 2 offered sessions do not work with their schedule. NO SMOKING! Smoking is the #1 way to limit your singing. Not only are its effects fast-acting, they inhibit your vocal range & breath support. Students wishing to gain a basic introduction to dance and movement prior to the audition are invited to attend a "dance prep" session the week prior to auditions. Elements covered at this session will NOT be the same as elements covered in the audition, but instead will allow students a chance to gain insight and confidence with the concepts prior to audition time. Proper dance attire in the audition time does not need to be "professional" dance attire. Students should ensure they come wearing clothes that they feel comfortable moving in (i.e. they are able to use their full range of motion: all the way from fully raising their arms above their head, to bending over to touch their toes.) The last thing we want is for students to be preoccupied with fixing their clothing instead of being able to fully concentrate on the audition process. Students who do not wish to dance barefoot should come wearing clean, comfortable sneakers/gym shoes with good grip.